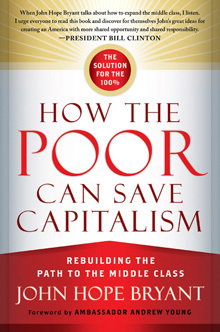 Wednesday's panel discussion of "How the Poor Can Save Capitalism" is sparked by the book by John Hope Bryant, who will be one of the panelists. A new twist on boosting the U.S. economy — by showing how the poor can save American capitalism — will be the topic of an interdisciplinary discussion Wednesday, Oct. 29, from 3-5 p.m. in Room W525 of Goizueta Business School. Emory Provost Claire Sterk will lead a panel discussion based on a recently published book by John Hope Bryant, "How the Poor Can Save Capitalism." Bryant is the founder and CEO of an Atlanta holding company and also founder, chairman and CEO of Operation Hope Inc., a non-profit foundation focused on entrepreneurship as a path out of poverty. He will talk about the crisis of capitalism, rising economic vulnerabilities, social exclusion and what to do about them. Andrew Young, pastor, civil rights leader, former U.S. ambassador to the United Nations and founder of the Andrew Young Foundation. "Trial and error tell us that no single academic discipline holds all of the tools and therefore not all of the answers necessary to address depravity of all types – be it economic, social or political," Sterk says. "Therefore, to work towards resolving the many problems that we face as a society, previously unrelated studies have merged. This is especially true for the relationship between those who work on development and leadership." The premise of the panel discussion fits well with Emory's culture and community, Sterk adds. "While reading John Hope Bryant's book, I could not help but think about the values that this environment and that Emory more broadly instill in students — to give back to your community, to use love instead of fear, and when given the opportunity to lead, do so justly and with compassion." Maasoumi characterizes "the Bryant and other similar systems, such as 'micro finance,'" as aiding sustainable mobility out of poverty and into the middle class. "In other words, this is more about the significance of the 'middle class,' its size and its impact on general economic well being, as well as the sustainability of democratic institutions," he says. "My own view is that the significance of the middle class is even greater to a market economy, such as the U.S., with two-thirds of it being the 'consumer.'" This event is cosponsored by Emory's departments of economics, sociology, film and media studies, African-American studies, development studies, religion, African studies, and the Candler School of Theology.